Ballpark Basics: Could the Braves change the way the next generation of ballparks are built? When the Atlanta Braves announced that they were moving to a new ballpark back in November of 2013 the baseball world was shocked. Turner Field was not yet 20 years old and seemed to be in pretty good shape. However, the Braves were becoming frustrated with their downtown location (confusing mass transit options, cramped concourses, etc.) and most of their season ticket holders resided in the wealthier suburbs of Cobb County. 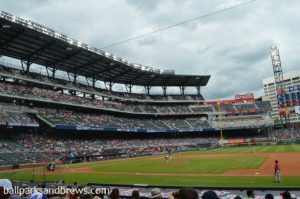 We had taken in a couple of games at Turner Field and noticed some of the issues. However, we weren’t sure these issues warranted a brand-new ballpark. 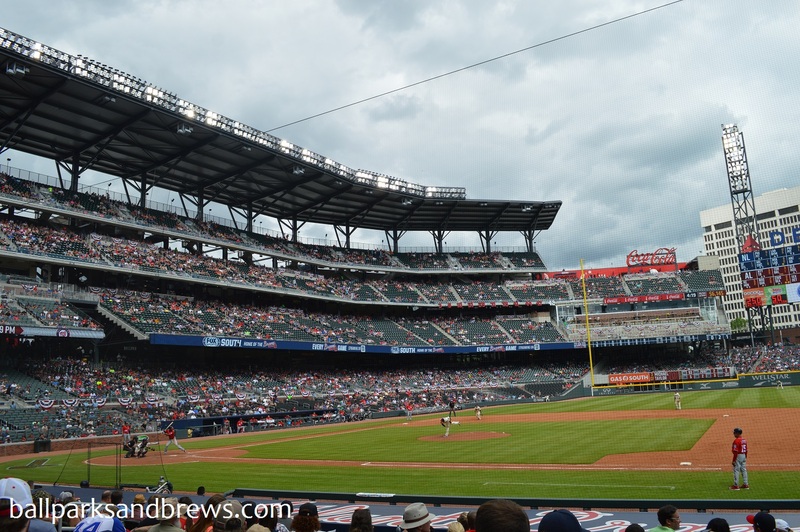 Upon taking in a game at SunTrust Park we can see why the Braves made the switch. 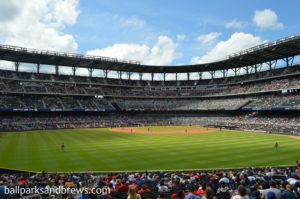 Whereas Turner Field was surrounded by parking lots and highways, the Braves purchased 57 acres in Cobb County with which they built a small city that surrounds most of SunTrust Park and dubbed it The Battery. 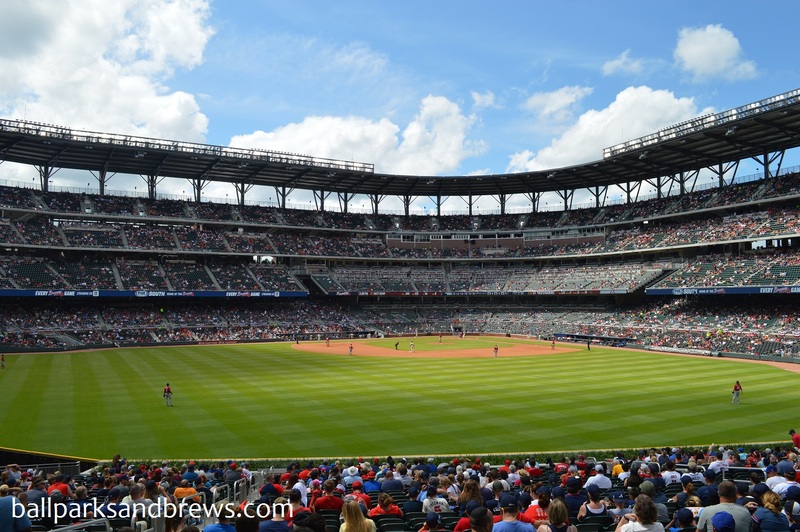 The Braves own the land surrounding the ballpark and look to reap the benefits of the income from the shops, restaurants, offices and apartments that make up The Battery. Will other teams jump on this idea and start building new ballparks out in the suburbs as a part of new mixed-use developments? Time will tell. As for the ballpark itself, it is nice. However, there is not one thing that truly stands out to make this an iconic ballpark. 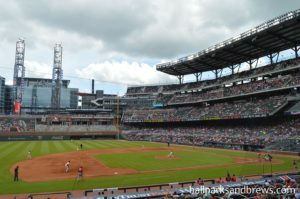 In fact, may of the same major sponsors (Delta, Coke, Chick-fil-A) from Turner Field are back and gives it a similar feeling as the ballpark it replaced. We were also surprised at the number of buildings that filled the backdrop making it seem as if the new field were downtown and not situated next to a large highway miles outside of the city center. Best Spot For Beer: This is a tough one. 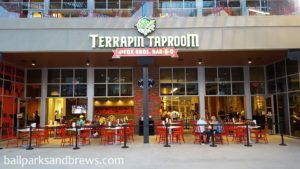 The obvious choice should be the Terrapin Taproom in the right field corner. However, to enter the taproom during the game you must wait in line and get your ticket scanned. Once inside, your only options are (obviously) from Terrapin. The you must go through another line and go back through a metal detector to get back into the ballpark. This causes a ton of delays when just trying to grab a quick beer. Most concession stands have the same four beers: Coors Light, Blue Moon, Leinenkugel’s, and a Terrapin offering. There are Tomahawk Taphouses spread throughout the concourse and they typically had a couple of additional offerings including some from Red Hare Brewing and Yuengling. 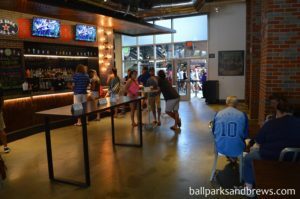 Overall, we were impressed with the development as a whole rather than the ballpark itself. Hours after the game finished you could still find families grabbing dinner, playing in the water fountains, or playing catch on the AstroTurf field just outside of center field. There were also groups of young professionals stretching out their Sunday afternoons with a couple of additional drinks in one of the bars in The Battery. With a piece of all of this revenue going into the Braves’ pockets it’s easy to see why they took a gamble their new home. Brew Basics: The Brew Lab takes Terrapin back to their early days of creative freedom. 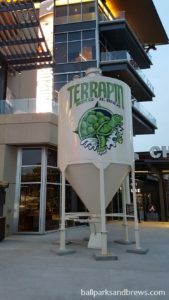 Terrapin Taproom and ATL Brew Lab is part of the mini city that Cobb County is building on the perimeter of their new ballpark. 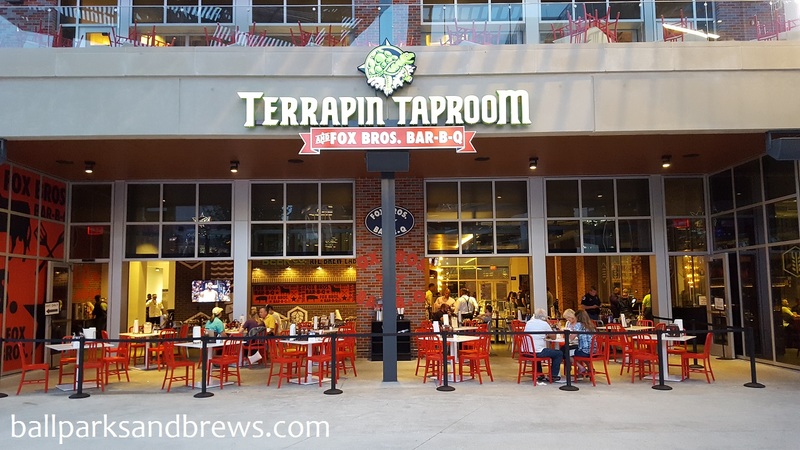 Situated on the main thoroughfare, and easily identified by the signature Terrapin fermenting tank mounted just outside; the ATL Brew Lab is a full service restaurant, having paired with “Atlanta’s famous” Fox Bros. BBQ, which we did not eat, but looked (and smelled) quite good. The brew tanks are visible through frosted glass on the outside of the Lab, but you have a clear view of the whole works once inside. There are two sections of seating – table service and bar, and large garage doors to the side of the main dining area that lead to covered outside seating as well. We sat on the patio and enjoyed the people watching, but be warned that it can be quite loud as there is a large fountain with shrieking kids right outside the porch, and the music being piped onto the walking concourse competes with Terrapin’s patio speakers. The – apparently permanent – Fox Broadcasting booth is also just to the right, which could add to the noise or the great people watching depending on your personality. 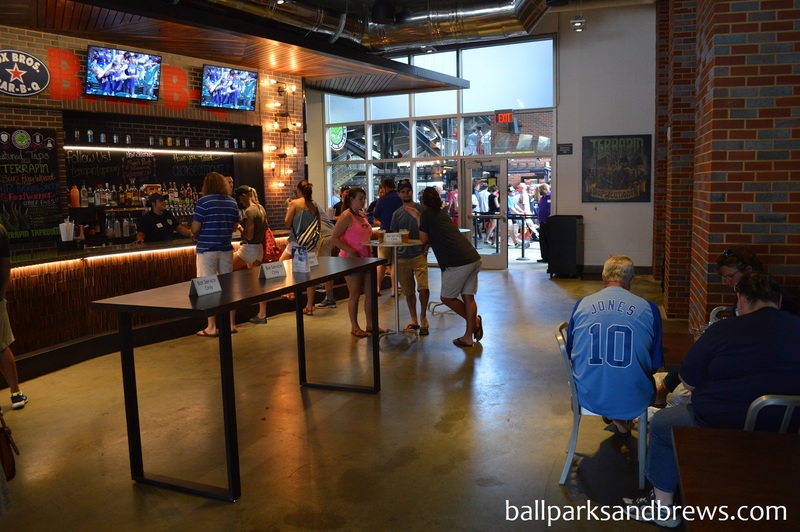 The ATL Brew Lab can be accessed during normal business hours through the main entrance, but during games also has a door that will lead you right out onto the first floor concourse of Suntrust Park. During the game you can enter the Lab without having to leave the park, though they do scan your ticket before allowing entry from that side. Security is in full effect at the Home of the Braves, which means if you’d like to leave the Lab and re-enter the game, you have to go through security (and we’re talking airport style, remove your belt and cell phone, bag search, metal detector security) which slows down the process considerably. In the summer of 2016, Miller/Coors became the majority stakeholder of Terrapin Brewing. Purists would argue this no longer gives them craft beer status and therefore should not be paired with the new Suntrust Park. However, like Goose Island in Chicago, Terrapin is using Miller Coors to mass produce their staple beers (Liquid Bliss, Wake n Bake, Hi-5 IPA, etc. ), which gives the ATL Brew Lab the ability to experiment with small batches like they could when Terrapin first opened. With two exceptions, our reviews focus on these small batches that are brewed onsite and available exclusively at, the Brew Lab, which fits the craft beer bill in our book. Those marked with a  are these exclusive brews. Maggie’s Peach Farmhouse (5.3 ABV/22 IBU) One of the staple Terrapin seasonals, Maggie’s Peach is a fruit forward saison that pours a bright golden color. The peach is quite noticeable on first sip, also in the bouquet, where it blends with the malts. The style helps make this beer less sweet than other peach seasonals, since the saison spice helps cut the fruit flavor with a little bit of tanginess. It’s Baseball Saison (5.9 ABV/25 IBU) We ordered a flight, which allows you to choose 5 of the currently on tap beers. The beers we chose all came in slightly varied hues of sunshiney gold, but of the five, this was the lightest, with almost a lemonade like look. Fizzy and Belgian styled, the palate was strongly breaded and yeasty and left you with a sourdough aftertaste.  Chopsecutioner (5.0 ABV/60 IBU) Terrapin fans may identify this as a name twist on one of Terrapin’s most popular signature beers, the Hopsecutioner (see below) but Chopsecutioner surprised us by having a significantly different profile than the original. The Chopsecutioner is designed to be a session ale…baseball games can be quite long. Along with the lower ABV and lighter body, Chopsecutioner’s main claim to fame is that it is aged over wood chips from Mizuno brand baseball bats. This does actually add a bit of woody air to the light aroma and medium palate, which is hopped without being killer. Hopsecutioner (7.3 ABV/71 IBU) Compared to the Chopsecutioner this definitley isn’t the same beer. Darker in color, Hopsecutioner has a bigger body, sharper bite and higher ABV and IBU counts. This IPA is is a blend of Amarillo, Cascade, Centennial, Chinook, Simcoe and Warrior hops, and is a perennial favorite that helped put Terrapin on the map. On Deck IPA (6.5 ABV/ 65 IBU) The On Deck of our visit was a west coast style IPA with Amarillo, Citra, Galaxy and Simcoe hops. Surprisingly floral in both aroma and palate, but with some grapefruit at the end before a bitter hop finish. Possibly the most interesting of the beers that were coming out of the ATL Brew Lab while we were there, since they are planning on changing the hop varieties and amounts for each new batch which means the On Deck that we tried might be very different next time.